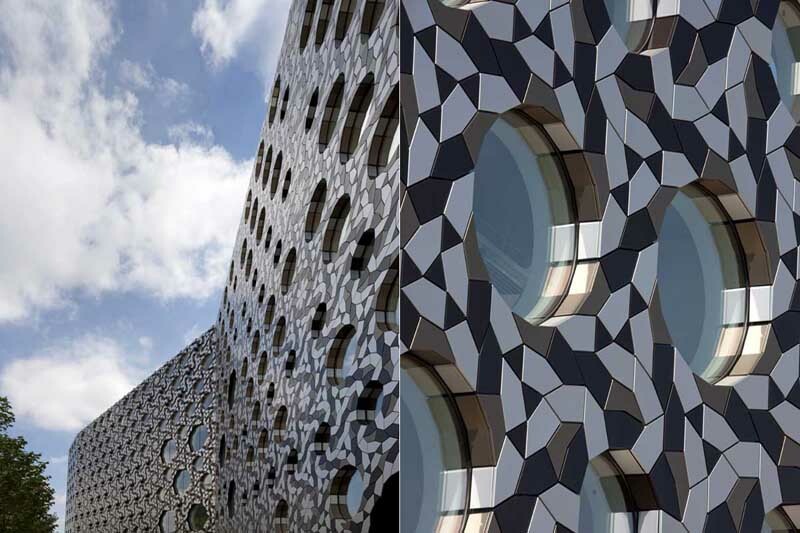 Ravensbourne College – London, U.K.
AE interests: Complex exterior envelope developed using three different anodised aluminium tiles to generate seven different window typologies. Perforated concrete walls and central columns provide large open spaces for use as lecture halls and other academic functions. Open-plan work spaces over four stories to house 1400 students for interdisciplinary fields of study connected by central atria. 360 London – London, U.K.
ae interests: the shape and positions of the interior columns maximize the enclosed circular space. Napp Laboratories – Cambridge, U.K.
AE intersts: exterior glass curtain wall, sloping design blends with landscape, linear shape allows for expansion and flexibility. AE interests: curved concrete roof, concrete column supports, glass facade for natural effect, glass louvers for sun screening. AE interests: feeling of intimacy, no seat further than 107 ft from the stage with unobstructed views. Double shell blocks external noise, renovation equipped with adjustable acoustical canopy, glass exterior transparent at night and refelctive during the day.